Sustainability Initiatives: Harvesting of rain water from the roof; use of timber frame; fast construction period; installation of stainless steel roof to minimize contamination of rain water. CHP units, low energy lighting, efficient heating and ventilation plant. 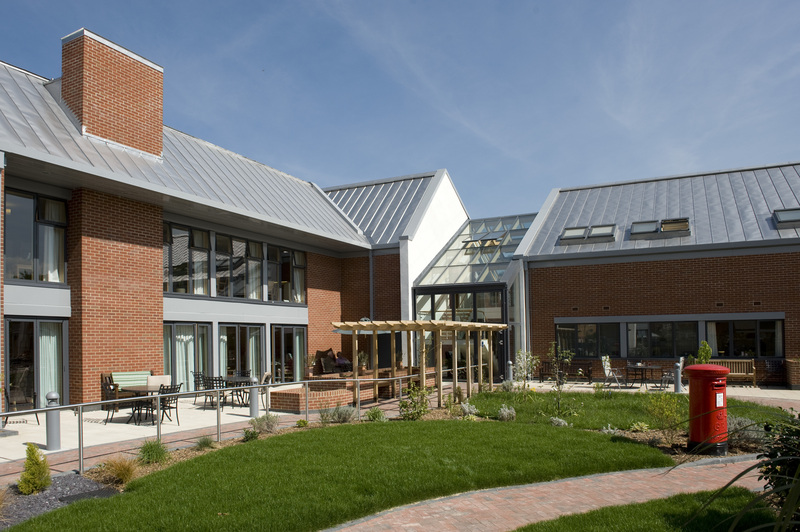 This residential care home, day care centre and respite facility for older people with dementia was the first of its kind within the borough and a flagship project and model for future care homes. The centre accommodates 40 residential clients, has 30 day care places and 4 respite rooms. Due to the specialist nature of the project, a number of field studies were undertaken as part of the consultation exercise to aide design considerations such as: domestic scale and character, barrier-free, safe and secure environment, flexible, attractive and useable landscaping. Public consultation took place as part of the Planning Process to allow local residents, relatives of the clients and Borough Councillors to view the design and to take part in Question and Answer sessions. The building is constructed of a simple pallet of materials with facing brickwork and off-white coloured render to the external walls, composite windows and stainless steel profiled roof. The roof is deliberately broken down into its component parts to break up the mass of the building. The building is split into two wings and these are terminated with gable ends with high-pitched roofs. The two wings are joined centrally by a glazed atrium, which forms the entrance to the residential home. Winner: UK Over-50s Housing Awards 2010.